The environment of today’s organizations is characterized by continuous changes at an ever-increasing speed. Competition rules change all the time and organizations need to be more flexible as they rise to the challenge of becoming “better, faster and cheaper”. This increasingly more dynamic environment is characterized by a huge number of risks, which exist both inside the company, throughout its processes and projects, and at the network level. For this reason, managers should focus their attention on the achievement of the specific objectives of each process and project, depending on the priority that the top management assigns to all of them. However, a best practice gap still exists for analysing risks in projects and processes utilising a systemic perspective. 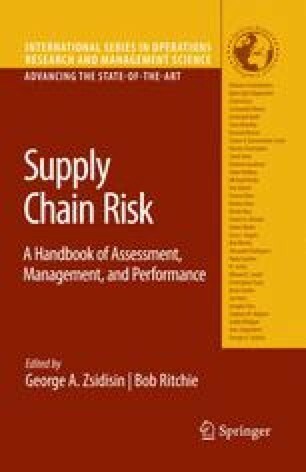 The purpose of this chapter is to explain and evaluate the new challenges faced by supply chain management in adopting such a process- and project-based orientation within the supply chain. The intended outcome is to offer some suggestions on how to assess and manage supply chain risks that otherwise might jeopardize the achievement of supply chain goals whilst, also ensuring profitable supply chain management. First, the chapter will describe the drivers for success in projects and processes. These drivers are: the focus on the objectives, the implementation of change management, the definition of the responsibilities and finally the measurement of performance and risk. These drivers might represent the starting point for the definition of the risk assessment method. It means that the assessment of risks in processes and projects might comprise in its steps these drivers for success. Finally, the chapter will describe the steps comprising the assessment of risks in processes and projects. Marsh and McLennan Companies (2005) MMC Reports 2005 Results. www.mmc.com.